Why it’s important to improve your credit score. I wouldn’t consider myself a loan expert as I don’t have much experience with taking out loans. If there’s one aspect of finance I’d like to brush up on, it would be on the ins and outs of borrowing since I haven’t done much, being someone who carries a limited number of cards that are usually paid in full, and who has only borrowed to purchase a house. So here’s a first stab at a more in depth loan discussion, where I get a bearing on how debt and credit can hit one’s finances. How Much Does Something Really Cost You? One thing that makes an impact on me is the realization that we all actually pay for the same thing at different price points. Someone you know may show off his brand new motorcycle and looks to be living large. But do you know how he’s actually paid for his toys? How many years of his future could he have signed away and how much more is he paying for it than say you would, if you bought that motorbike in cash after actually saving for it? $24,000 for someone who pays for it in full. $26,725.24 for someone with excellent credit, perhaps qualifying for the full loan with a 3 year term at a rate of 7.12%. $29,111.57 for someone with mediocre credit, taking out the full loan for 3 years at a rate of 13%. $32,109.33 for someone with poor credit for the full 3 year loan at a rate of 20%. That’s an incredible difference that ranges from almost $3,000 to $8,000 in 3 short years! So how does this happen? When you need to take out a loan, your FICO credit score has a lot of influence on how much it’s going to cost you to borrow. Lenders check your credit score to determine your credit risk. Based on your score, the loan industry has calculated the odds of your falling behind on your debt payments. Now let’s take for instance the case of mortgage loans: lenders have found that there is indeed a strong correlation between credit score and delinquency rate. A point or two difference in rates due to different scoring levels will make a massive difference in how much one pays for a home. The difference is typically in the hundreds of thousands of dollars throughout the life of a mortgage. As of June, 2007, here are some loan terms to ponder. These examples of debt load are very typical of what we all carry here in California. The median FICO score is 723. If you score 760 or higher, you get the best rates. If you score lower than 620, you’re in the subprime category which could mean 3% – 6% difference in rates compared to someone with better creditworthiness. In terms of mortgage loan amounts, the difference is astounding: That $800,000 house you’re stretching to get could cost you double that house in 30 years compared to somebody else with a better score. With A FICO score of under 500-520, you’ll unfortunately need to kiss your dreams of owning a home goodbye. In this case, you won’t even be able to qualify for a mortgage. With the ridiculous interest you would end up paying for such expensive loans, I’ll say this is actually for the better. Work to improve your credit score and save enough for a decent down payment and you’ll be in much better shape. Here are other areas that a poor credit rating can have a detrimental effect. It can be more expensive or cost you opportunities! All in all, money talks and lack of money talks even louder, making you go through hoops if your scores aren’t pretty. Let’s put things in perspective then. As worried as we are about spending $5.00 extra dollars for a daily cup of latte, I’d say one’s focus for saving money should be on the big ticket items. Especially if it involves borrowing money to acquire such items while having a shaky credit score. While we’re sweating the small stuff and worrying about the best ways to save $1.00 a week, let’s keep this in mind: don’t lose sight of where the big savings are — beef up your credit score and keep your borrowing to a minimum if you can. That’s where you’ll make the biggest impact on your financial status, and pardon the cliche, where you’ll get the biggest bang for your buck. This is an excellent article. I had not seen the data on how a credit score actually impacts your interest rates. Very helpful. I’ll be honest and say that some of this was new to me as well. Especially since I don’t spend much time on the debt front. It’s great how research and other online views are opening my eyes to this sort of thing. This is truly valuable information. There just can not be too much consumer education with respect to credit scores and the far reaching impact they can have. A very nice article. Honestly i don’t much of the information you’ve just mentioned as i am not actually fond of loaning or using credit cards that i am sure make me want to go shopping a lot and just mind my debt later of which i know will be a little hard. It is better to save before deciding something which need some money but then if you really need it why not just be sure you can handle it and as this things are already posted for you still the decision lies to you. I found this to be a very subtle lesson in credit that doesn’t seem to be as well known as I thought. I’m going to make it my mission to study this line of finance much more closely! My credit went into the tank several years ago when a health collapse left me unable to work and without income (and thus unable to pay bills) for a year. I ended up with two credit derogs which won’t go away after seven years – the clock won’t even start to tick until those issues are resolved. I can’t resolve those credit issues on my minimum wage income. So how do I get out of this hole if I can’t get a good job and can’t get good rates? Or should I just accept being poor the rest of my life? 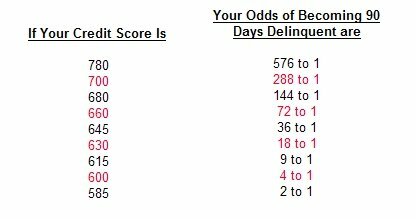 Nice post shows how important it is to look after your credit score. One late payment on the credit card or mortgage and you will pay for this later on. I work in the lending industry, and you definitely raise a valuable point about the cost of money. As your credit score goes down, your cost of money almost always goes up. That being said, there are instances in which it makes more sense to buy on debt than with your own savings. If you are a savvy investor and can make an annual return of 10%, then it actually makes sense for you to take out a loan at 8% to buy your car even if you have enough money in the bank to buy it without debt. That’s the power of leverage (debt). Just something to keep in mind. Credit cards really hurt your credit score. Stop using those credit cards. the interest kills. Get money from a cash machine. This way you see the money you spend. Ed: Not quite sure this makes sense…. Tender spot hurting a lot? Other side too? bruises on your face and body throbbing? Did you recognize the tail lights of the limo that threw you off? Was it the same limo that picked you up at election time, promising a good decent clean ride? Will you ever learn? Last time these guys did this to you, your babies were sent to Iraq and your retirement fund spent to do it, your taxes went up, but no weapons of mass destruction were ever found. Poor little America. Our heart-felt prayers from Canada go out to you! Ed: Heavily edited for strong language. The BEST way to take care of your credit score is to keep paying your bills on time. Absolutely important if you do not want to suffer with bad credit. Secondly, a lot of people just assume that since they are paying their bills on time, their credit report has fantastic things to say about them. What many people do not realize is that sometimes there are errors in your credit report and these errors can cause the magical 3 digit figure to decrease. So you need to keep a close eye on your credit score. The best way to do that would be to apply for a credit report and see what your lenders will see when they pull your credit report every time you apply for a loan. If you find any errors, report them as soon as you can so that they get removed from your credit report, keeping it clean will benefit you in a number of ways and getting a loan with low interest rates will become a very easy job for you. It is interesting why they don’t teach everything about credit scores and well basically overall financial education in school. We are lucky that we have internet for all that information. Thanks for blogs like this. A poor credit score is indeed something you should worry about since everybody wants to buy a house sometime in his life and most people need a bank to make sure they can pay for their dream house. The thing I missed in your post is some ways that will work to get your credit score higher than before. Here is what you wanted, I hope: how to improve your credit score. These are some steps you can take to raise your credit score. Exactly. A bad credit score and poor credit rating can affect your loan rates in a negative way. A good credit score helps getting loans at low interest rates. So keep it healthy.